EXTRA STRONG MATERIAL- made with long lasting exceptionally strong material, a stainless steel body with a coper motor 800 watts ETL approved, metal gears and stainless steel blade to ensure proper grinding and enjoying our product for a lifetime. WHAT IT'S CAPABLE OF- included in the package is 3 different cutting plates for fine, normal and coarse grinding, kibbeh attachment and 3 (small, medium and large) stuffing funnels for all kinds of sausage use, so you get the maximum out of the product. EASY TO OPERATE- with our ultra-easy-to-use control panel it wouldn't be hard to use it comes with 4 buttons, 'on' is to turn it on, 'reverse' to reverse the direction of the motor (if something remained stuck), 'half' for half speed and 'stop and reset' to turn it off. 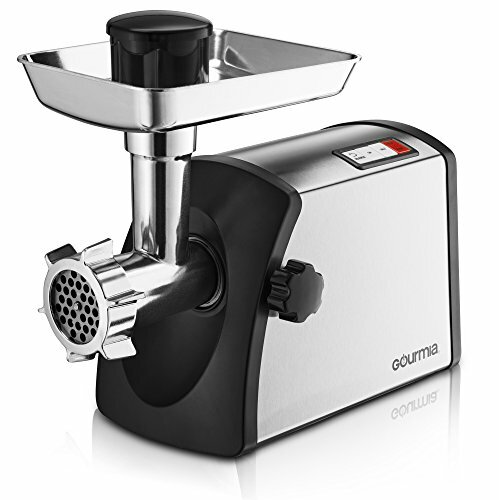 EASY TO ASSAMBLE AND CLEAN- with every Gourmia Prime Plus Electric Meat Grinder there comes along an easy quick guide and manual so you can assemble and take it apart easily for easy use and quick cleaning. IDEAL FOR- with our variety of included attachments and recipe book filled with over 10 recipes you can create the most delicious food as per our sausage funnels for sausage's, kibbeh attachments for kibbeh and 3 different cutting plates to create the most flavorful burgers, meatball's, meat loaf and hash.